Global business never stops, which means business travel doesn't, either. As specialists in corporate travel, we offer a punctual, efficient and professional airport transfer service between your home or office and the front door of the terminal, 24 hours a day, 365 days a year. We're also aware that business trips sometimes involve taking bulky, fragile or valuable items with you; our skilled and experienced drivers will make sure they get there safely, too. And whether you're flying from Heathrow, Gatwick, London City, Stansted, another regional airport, or Eurostar station we'll get you there on time - every time. Our professional drivers will take care of your airport transfer to and from Tonbridge, Hildenborough, Shipbourne, Penshurst, Leigh, The Weald of Kent and other locations across the south east. 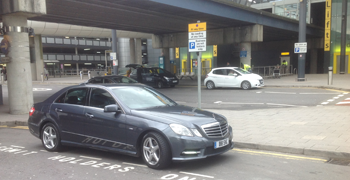 A £5 "Meet and Greet" charge will be applicable for airport collections. Where applicable, congestion charge will be payable.